Asymmetric earrings 2” long in 4 colors with silver & gold detail, shown in Bazoche (left) and Manhattan. 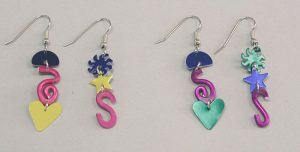 Asymmetric pair of earrings 1 ¼” Long, three colors, shown in Pink (top) and Primary. 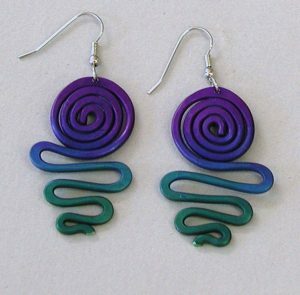 Asymmetric pair of earrings 1 5/8″ long, three colors, shown in Caribbean (left) and Cool. 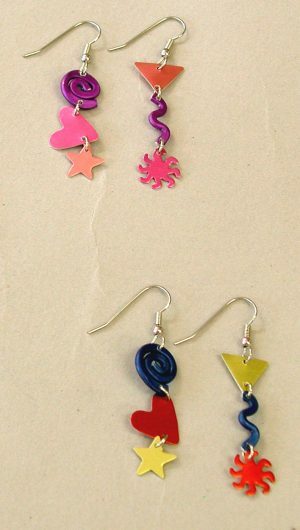 Asymmetric pair of earrings in 3 colors, 1 ½” long, shown in Primary (left) and Firenze. 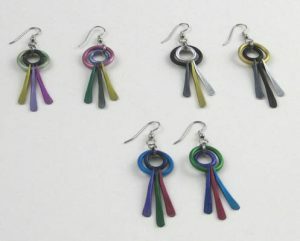 Pair of earrings in 6 colors 2″ long pictured in Basic (left) & Primary- matched or asymmetric. 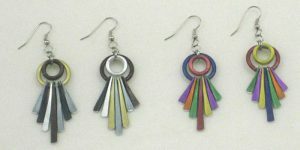 Pair of asymmetric earrings in 5 colors with sterling silver detail 2″ long pictured in Danube (left) & Cool. 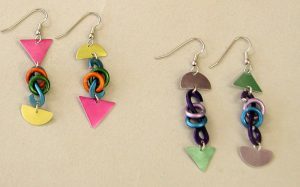 Asymmetric pair of earrings 1 ¾” long, five colors, shown in Hawaii (left) and Ocean (right). 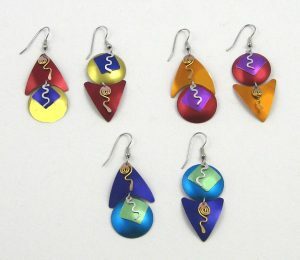 Asymmetric pair of earrings 1 ¾” long, four colors, shown in Sienna (left) and Norwegian Night.